A while ago, I attended a workshop on ‘Creating positive learning environments in the early years’ to better understand how to foster the love of learning in children. While speaking about outdoor play spaces, one of the things that the presenter focused on was promoting the love for nature in children. ‘Children need to experience and enjoy their relationships with nature to be able to appreciate it and care for it because what one never experiences, they will never value.’ This is so true and as we began pondering about our unit on ‘Sharing the planet’, with its central idea, “Our curiosities lead to an appreciation of nature” and the opportunities and experiences we could offer the children, we could not think of a better idea than spending most of our time outdoors, exploring and being surrounded by nature. After carefully considering a few places to visit, we decided on three to begin with, which were suitable for morning excursions. Baner hill was one of them. 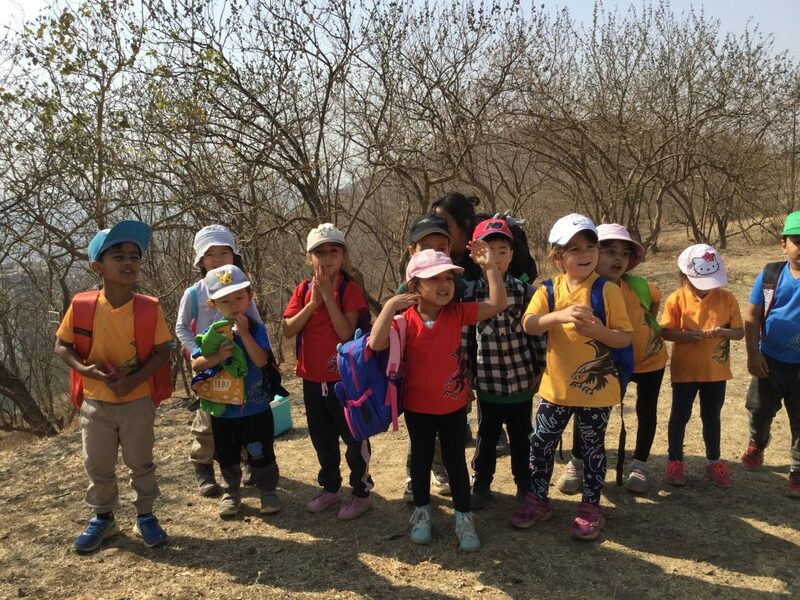 The last of the preplanned class trips, the Baner Hill trek on Wednesday 30th January was such an exhilarating experience. One could tell that our senses were invaded, indulged and woken up just by the thought of being on top of the hill. The children once again proved that they are competent, resilient individuals and rose up to and endured the challenges they faced. For many, it was their first experience climbing a hill. They encouraged each other and helped one another as they climbed rocky slopes and gritty paths. They spotted birds soaring above them and wondered what they were looking for. They observed tiny butterflies that changed colours as they sat on the ground and encountered numerous birds that flew away as we approached. They stopped and felt the breeze as they climbed higher and were curious to know who put the tiny fish in little concrete tanks and how those fish remain safe when people take water out to water newly planted tree saplings and bushes. Seeing footprints on the steps and paths leading up to the hill and the forest that was close by made us wonder if there were tigers in the forest and how we would protect ourselves. The children noticed that some of the tall buildings were not as tall as they thought as they climbed higher. Some spotted red fruits growing on a tree by a water tank. The map of the hill and other signs were closely examined by a few eager learners. The seed pods hanging down from a Gulmohar tree and bird nests became a subject for discussion. Some of the children wondered about rocks and pebbles that were green and some of which were shiny and a few secretly carried them back to school. Someone vowed to never go on a trip again as we climbed up but persisted and reached the top with some encouragement from their classmates. The children remembered that picking up rubbish left behind by others had been part of our earlier trips and inquired if we could start as we ascended the hill. Our senses were working at their best as we listened to and followed instructions to climb up and down safely while observing the nature around us. Apart from a few minor scratches, everyone came back down safely. Some of the children wondered if we could come back with all our parents for a picnic. The sunset is gorgeous from up on the hill and one can see many bats and roosting birds at that time of day. How about a family trip in the evening? We were all hungry and exhausted but that sense of pride and achievement from conquering the hill left us all feeling good and a few wished to go back the next day. Looking through the photographs that were taken during the trip and from children’s observations, conversations, questions and reflections, clearly, the children have begun wondering about nature, the relationships between living things and their environment and of course, our responsibility towards it. As parents and educators, how can we promote the love of nature, wonderment and inspire and encourage a sense of responsibility towards the natural environment to a generation engulfed by technology? Or rather how can we use technology to help our community connect with and appreciate nature? After all, there is only one earth to share and take care of.